It's too hot to exercise? Stop using it as an excuse, there are ways to keep up your fitness when it's hot. 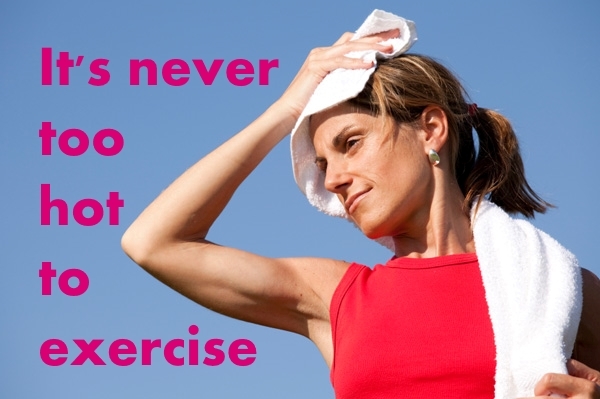 Here are some top tips to keep exercising even when the sun is out. 1. Go in the morning. So it's hard getting out of bed at 6am for a run? Try getting back from work at 6pm when it's 10 degrees hotter and motivating yourself! Trust me, early is better as evenings are always much hotter than mornings. Take a look at a weather forecast which breaks it down into hourly or two hourly chunks to see just how much cooler it always is in the mornings. Also you get a smug feeling of "I've already done my exercise for the day". If you'd normally do a 5 mile run, maybe make it a bit shorter, perhaps 3.5-4. Getting out is what matters. It's not going to matter in the big scheme of things if you decide to make today a Pilates day or Yoga day rather than a HIIT day. Just if the heat continues, if you want to keep as fit you will need to do some cardio and strength as well. Alternatively go for a long walk in the sunshine. Something is better than nothing. If you don't have air con (and no-one I know in the UK does for the 3 days a year you'd need it) try exercising outdoors, especially strength work outs can be done easily on a picnic mat on a lawn in the shade. The gentle breeze makes it more bearable. In this weather, every Lido in the UK will be rammed but indoor pools? Perhaps not so much and it's the one time climbing into the cold water will be a relief not a shock! Exercise classes and indoor gyms are often quieter in hot weather yet they're the one place which is probably going to have excellent air conditioning. Personally I'm not a gym fan but if a heatwave continues, it can be a welcome relief while still keeping up the intensity. When you exercise of course but also throughout the day as that will help your exercise periods too. If you normally wear full leggings, give shorts a try. Don't worry whether you look great in them, at the slightest whiff of sunshine in the UK, half the male population are pulling off their shirts and running around the park. None of them care so I doubt anyone cares about my wobbly legs either. When you're out running, those tree lined routes which can be too muddy in winter are great to dust off in hot weather. The mud is likely to have dried out but still giving plenty of shade to help keep you cooler. If you start to feel dizzy, unwell, sick or overheated, stop. What are your tips to keep active when it's hot? Let me know in the comments below.